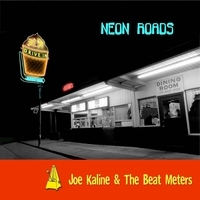 Neon Roads: "Walking On Sunshine" with 80's rock, surf, sax, and ska. Katrina & The Waves, early Los Lobos, & "Back to the Future" styled 80's rock, pop, surf, & ska w/ funky jazz sax, Hammond B3 organ, a Les Paul, a Marshall tube amp, w/ Pete(Sheila E's dad) Escovedo's drummer recorded on 2" Ampex 24 track analog tape. If you like Katrina and The Waves, early Los Lobos, surf music, the movie Back To The Future, Huey Lewis, Booker T and The MG's, with just a taste of Weird Al Yankovic and jazz and/or funk rock saxophone, you'll dig this album. The first 10 tunes of this collection were tracked by 5 great San Francisco Bay Area musicians playing really grooving jazz influenced roots rock recorded on 2" tape with a huge analog sound. It features Paul Van Wageningen(of Pete Escovedo's band) on drums, Norbert Stachel(former saxophonist with Tower of Power, Diana Ross, Roger Waters, Freddie Hubbard, Sheila E and currently with Roy Hargrove's big band) on fretted and fretless electric bass, Joe Kaline on tenor and bari saxophones and hammond B3 organ, James Tomkins on guitar, and Marianne Domin on vocals. It was recorded by Fred Catero and mixed by Mike Hersh at the old Music Annex in Menlo Park, CA. Then mastered in SF by Gary Hobish. The second 10 tunes were recorded in the garage studio on a Tascan 244 Portastudio 4 track cassette recorder at various times with similar personnel over the long haul. Jimmy Sage of Lee Rocker's band played drums on some of these cuts, and Joe Kaline's surf/jazz Stratocaster through his vintage Fender Twin adds lush vacuum tube reverb and tremelo to the mix. These were mixed by Rob Preston of Get Reel Productions. The photo of the HiFi Drive In was shot by Scott Hoover, who also did the graphics.